While I haven't really "celebrated" this occasion in the past, Sunday actually marked the 3rd anniversary of my blog. When I started this blog I didn't realize how important it would become to me and I am so grateful to all of you for your continued support. Annabelle Smudge Liner Eyeliner in Ohmygoth! 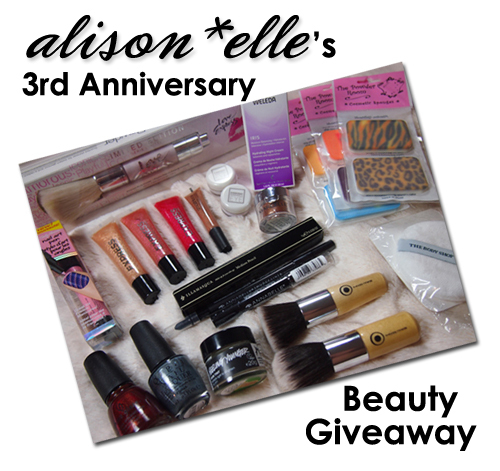 ♥ You must be a follower of my blog (GFC or Bloglovin) and leave a comment below with your e-mail address so I can contact you if you win. Since I will be shipping this out myself, this giveaway is open internationally. Giveaway closes MARCH 31 and a winner will be chosen by a random number generator. Good luck! Congratulations to the winner - Caitlin of Kitchen Grrrls! This is a pretty fabulous giveaway, so I have to put my name in; of course I follow you, well, everywhere ;) And you know how to get in touch with me if I'm the lucky winner. happy 3rd anniversary and thanks for having this giveaway :)!! I follow. Happy Third year!! Congratulations! Happy 3rd Blog Birthday! I'm already following you on GFC and bloglovin. Congratulations! I'm a GFC follower. I have my own giveaway going on too! Congrats on your blog anniversary! The giveaway looks amazing! I followed you both on google friends connect and bloglovin. Wow 3 years!! Congratulations! I follow you on Bloglovin! Fantastic giveaway! Congrats on the 3 years! Yay! Congrats! I follor on GFC and my email is Jsheahay@aol.com! Thanks for the giveaway! Following your blog now... Thanks for the comment on my blog. This is such a great giveaway and a wonderful blog! My email is hblaisauce@gmail.com! Great post and nice blog ! I will be here more often, I'm your new follower! Don't forget to check out my blog and facebook page! Happy Birthday to your blog & that's one amazing prize! Awww, congratulations on three years of blogging and thank you for being one of my first readers :) I wish you nothing but the best! and I liked your page under my personal acct and shared the giveaway through Beauty Fiend's blog page. Happy anniversary!! Thank you for the giveaway!!! Congrats, cOngrats, coNgrats!!! Happy 3rd anniversary and wishing you many more! Wow, this is awesome. Congrats on 3 years! Follow you on bloglovin now!My name: cardiac! Following via FB, Twitter, Bloglovin and GFC. Congrats Alison! I follow you on Bloglovin. Also like you on FB and shared giveaway post. Congrats to 3 years of blogging! Happy third anniversary Allison ! Oh! and followed on Bloglovin forgot to say that whoops.